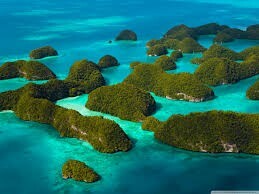 Japan is located on an archipelago, which is a chain of islands. Most people settled in narrow river valleys and along the coastal plain. Mild climate and sufficient rainfall which helped Japanese farmers make the most of the limited arable land. Surrounding seas protect and isolate Japan. Japanese sealed themselves off from foreign influences. Japanese came to fear and respect the dramatic forces of Nature. Japan lies in a region known as The Ring of Fire. Japanese migrated from the Asian mainland more than 2000 years ago. Early Japanese society was divided into Uji, or clans. Each Uji had its own chief and a special God or Goddess. The current Japanese Emperor still traces his roots to the Yamato clan. Early Japanese clans honored Kami, or superior powers that were natural or divine. Shinto became known as the way of kami. Traditions survive to the present day in Japan. Located in beautiful, natural surroundings. Japanese language is distantly related to Korean but completely different. Japan and Korea were in continuous contact with each other. Japanese and Korean warriors crossed the sea in both directions to attack each other's strongholds. Chinese writing and culture that sparked a sustained period of Japanese interest in Chinese civilization. Each visitor spent a year or more there--Negotiating, trading above all studying. Japanese rulers adopted the title "Heavenly Emperor", claimed absolute power. New bureaucracy and adopted a law code similar to that of China. Had little real authority beyond the royal court. The Japanese Emperor built a new capital at Nara. Japanese officials and scholars used Chinese characters to write official histories. Japanese adopted pagoda and architecture.